100 yard rolls of 6 inch tulle premium quality soft tulle in Australia. 100 yards is 91m and 6 inch is 15cm. New shippment of tulle colours are slightly different is colour to the last batch. If you have any questions please contact me. This soft premium polyester tulle holds it shape to give you full and fluffy tutus. These 6" by 100 yard rolls of tulle are peferct for making tutu's. Buy 13 or more rolls and postage is free. 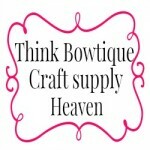 Sign up for our Newsletter to keep up with the lastest arrivals at Think Bowtique. Make sure you add us to your safe email list.